Born in 1961 in Bellinzona in Switzerland, Franco Cesarini began his musical studies at the Giuseppe Verdi Conservatory of Milan in Italy, where he studied flute and piano. He completed his training with Peter-Lukas Graf at the Basel Conservatoire, where he earned degrees in music teacher and concert performer as well as price direction of a conductor (in the class of Felix Hauswirth) and a composition prize with Robert Suter and Jacques Wildberger. Franco Cesarini has won several competitions as a soloist and chamber musician. In 1984 he received a scholarship from the Foundation Ernst Göhner Migros. In 1989 he was appointed professor of management and orchestration at the Zurich Conservatory. 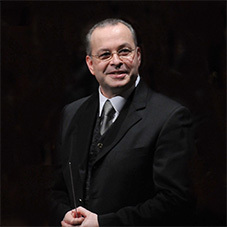 Franco Cesarini also teaches conducting at the direction of Italian Switzerland in Lugano. Since 1998 he is head of the Civic Philharmonic Lugano and directs the Conservatory of Music in that city. Composer Franco Cesarini is particularly versatile. His catalog also includes parts of Harmony for Orchestra, compositions for chamber ensemble, for solo instruments, voice, piano, String Quartet and Symphony Orchestra.